The new-dog trick is to plan ahead, and make changes before you bring Fido home. What was I thinking when I picked “the really active one” (now known affectionately as Izzy)? We solved the problem by constructing a cedar fence around the vegetable patch and my collector’s garden in the backyard, where the pooches hang out. The fence we designed is constructed of only horizontal rails. It allows for an unimpeded view of the plants, while adding an elegant touch to the garden. Although the fence is less than 3 feet tall, it was easy to train the dogs not to jump it. We didn’t fence the dogs out of every garden area, by the way. Instead, we gave them a few planted areas where they could romp and play hide-and-seek. Plants such as bluebeard, lavender, rock rose, black-eyed-Susan, cat mint and ornamental grasses are ideal for pet-friendly plantings because they are safe and flexible, yet strong enough to bounce back after being trampled by doggy paws. Besides a place to play, dogs need “rump spots”: places in the shade where they can dig a cubbyhole for an afternoon siesta. The problem is that some dogs siesta in a new spot every day. To deter this, place attractive, sizable stones in places you don’t want them to dig or lie down. Of course, safety is a major concern. The vet gave us a list of plants known as toxic to dogs, and we removed them from any area where the pups hang out and play. Ask for a list of toxic houseplants while you are at it. At the same time, remove any plants with prickers, such as rose, barberry and Pyracantha, or with sharply pointed leaves (such as yucca) that could cause serious eye injury. 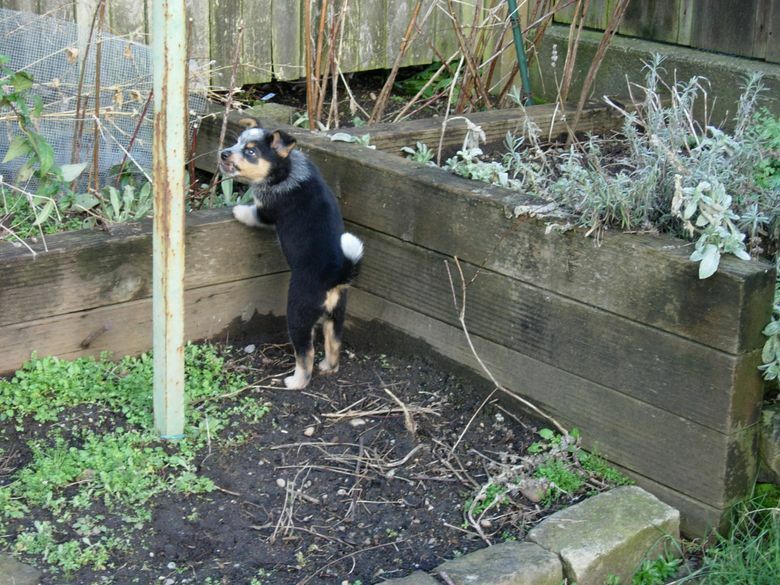 Don’t use toxic pesticides (especially weed-and-feed) in areas where your dogs spend time. The one part of your garden that is going to suffer is the lawn. It’s a waste of time to try to repair worn-down areas where young dogs play. And it’s almost impossible to solve brown spots caused by dog urine. Some food additives are said to help, but talk to your vet before using them. Products that claim to restore brown patches would have to be used on practically a daily basis. The problem is much worse with female pooches, by the way. 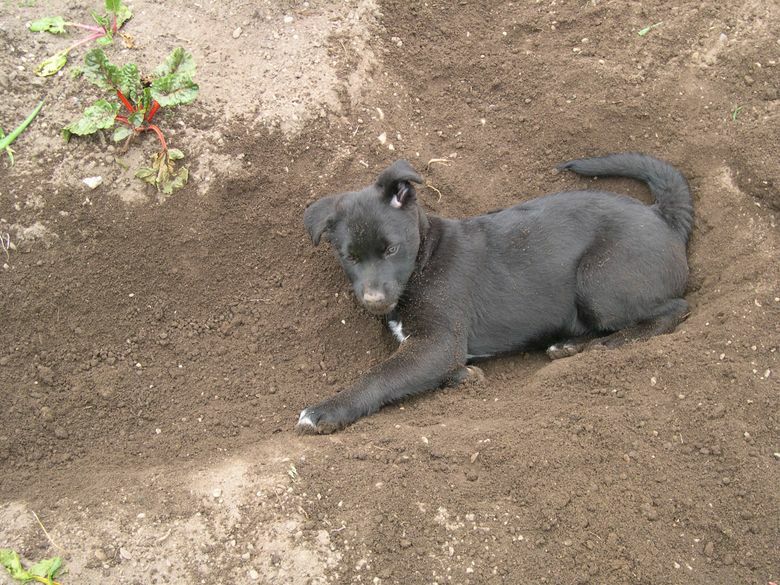 If you have a male dog, minimize the problem by planting a sacrificial juniper in a bed bordering the lawn. Finally, in my opinion, well-loved pups that are treated like members of the family and receive plenty of attention and exercise are easier to train. It’s a big mistake to make dogs live outside, or to lock them outside for long periods. Provide a doggy door so they can go in and out as they please. In the end, we love the living tweedle out of our dogs and want them to live fun, healthy lives. 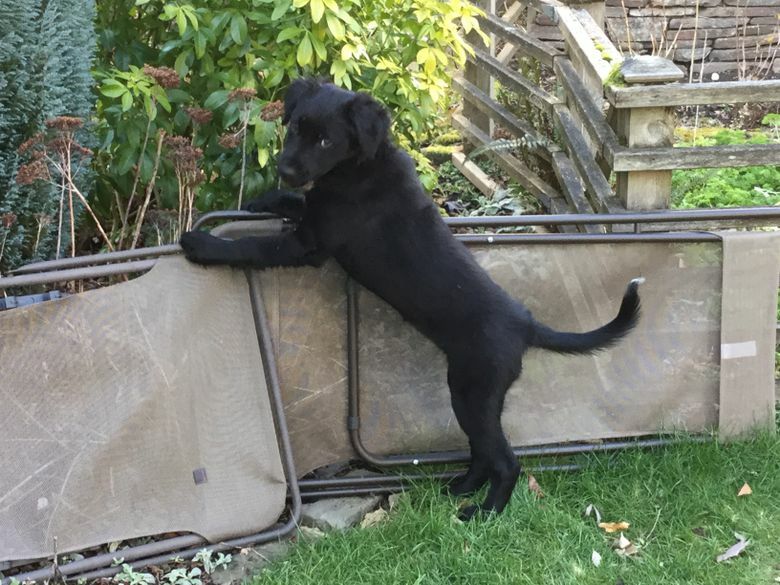 No matter how well you plan, pups get into mischief. When that happens, just look into those loving brown eyes, and you’ll forget all about the $500 irreplaceable Wollemi Pine she just trashed.